Also called mental health nurse practitioners, psychiatric nurses play an important role in the recovery of patients that suffer from psychiatric conditions and illnesses. These healthcare professionals have an array of employment options and the career development potential in the field is significant. In order to find employment as a psychiatric nurse practitioner, it’s important to get the best possible education. Many colleges offer degrees in the field but the quality of programs differs significantly. A psychiatric nurse practitioner is a healthcare professional who works with patients in an attempt to adequately address all of their mental health needs and concerns. Depending on the experience and the qualifications of the nurse, such a medical professionals may be involved in the treatment, the diagnostic process and the work with the patient’s family. From this list of duties, it becomes obvious that psychiatric nurses need a lot of medical knowledge and certain skills to be successful. Good educational programs focus on all of the essentials, preparing the future medical professionals for work in the psychiatric healthcare field. Due to an aging population and better diagnostic processes, the number of patients in need of medical assistance increases all the time. This is the main reason why the demand for qualified healthcare professionals is expected to grow in the years to come. Apart from benefiting from a wide array of employment options, psychiatric nurses have an excellent career outlook. The demand for such healthcare professionals in the US is expected to increase by 26 percent until 2020. This number is higher than the national average across all professions. There’s one more important factor to examine when it comes to the career of the psychiatric nurse. This factor is the salary. Currently, a psychiatric nurse in the US earns a median annual salary of 57,703 dollars. More experienced professionals that have 10 to 20 years of experience can expect to earn a lot more – in the range from 66,000 dollars to 80,143 dollars. In Canada, registered psychiatric nurse practitioners earn about as much as their US counterparts. The median annual salary is 49,145 Canadian dollars. More experienced professionals can expect to earn up to 87,876 Canadian dollars per year. Obviously, with the increase in demand for such professionals, salaries are also expected to growth. Thus, getting started with a psychiatric nurse practitioner program right now can guarantee excellent career development opportunities in the years to come. Are There Good Online Psychiatric Nurse Practitioner Programs? The minimum requirement for getting started as a psychiatric nurse is an associate or a bachelor’s degree in nursing. Such professionals can choose from a wide range of nursing programs like an associate of applied science or a bachelor of science in nursing. Specialization options are also available. People who already have an associate’s degree can go through an accelerated course that will enable them to obtain a bachelor’s degree in science fast. Online education opportunities are also available. Once a professional obtains a nursing degree, they can pursue a master’s degree. This is a specialized academic discipline that focuses entirely on psychiatric nursing and healthcare practices aimed at enhancing the mental health of patients. Online master’s programs are available. Depending on the school’s policy, a portion of the study program will have to involve actual practice. Thus, while most courses can be completed online, some attendance will be required. Every single school has individual requirements for individuals interested in applying for the psychiatric nurse practitioner program. Usually, the minimum requirement is having a bachelor’s degree in nursing and/or some nursing experience. Licensure as a registered nurse also ranks among the requirements for potential students. Additionally, some universities may ask for a letter of recommendation, a personal letter and a current resume. Scholarship applications will involve other documents and a separate application process. Working nurses who want to pursue an online degree as a psychiatric nurse practitioner in the US will also be asked to provide national certification (issued by the American Nurses Credentialing Center). Master’s programs in psychiatric nursing have a diversified range of coursework requirements. Students will cover an array of disciplines that prove important for a successful career in the mental health field. Management of psychiatric problems among minorities, women, etc. Examining the curriculum is an essential for choosing the best online program. Various universities offer such highly specialized courses. There could even be additional specialization possibilities. Doing your homework in advance and exploring the educational opportunities side by side is one of the keys to identifying the best online programs in terms of price to quality ratio. The reputation and programs developed by different schools are the two factors to examine prior to applying. Certain colleges have traditions in the field of psychiatric nursing. The staff has more experience and the programs offer overall benefits to students that enroll. Several rankings have been created to explore the quality of programs and identify the best schools. These charts take into consideration national rankings, clinical opportunities, affiliation with mental healthcare facilities, certification, competence of the staff and specialization options available. The University of Pennsylvania psychiatric nurse practitioner program has received the top spot in the US News and World Report ranking of mental health nurse practitioner educational opportunities. The private university has its school of nursing with 94 full-time faculty members. Graduate nursing enrollment at Pennsylvania University is 619 people and the tuition fee is 38,060 dollars per year for full-time students. There are several degrees that students can choose among. These include a master of science in psychiatric and mental health nursing, a master of science in psychiatric and mental health and a master of science in psychiatric and mental health NP/CNS. Apart from the standard curriculum, the university ensures a clinical experience for all of the students enrolled in its program. 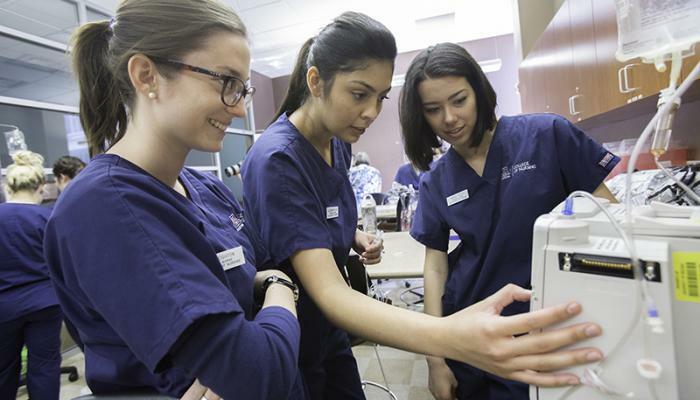 The clinical experience gives students much-needed practice in caring for patients that suffer from mental illness and a chance to do comprehensive treatment management. There are strict admission criteria for the students interested in enrolling at Pennsylvania University. These include a valid registered nurse license, previous experience, minimum one year of nursing experience, GPA of 3.0 or more and official GRE scores. Rush University is another academic institution that has an excellent psychiatric-mental health nurse practitioner (DNP) program. There are 56 full-time faculty members in the nursing school, which is determining for the quality of the academic program. Tuition for the master’s program starts at 947 dollars per credit for the full-time program in nursing and 999 dollars per credit in the DNP program. Students can obtain their degree in anywhere between 2.5 and three years. There’s a class size of 30 students and a chance to complete most of the education online. Apart from the online program, there’s also a campus-based experience for a day or two. The requirement for the completion of this program is 620 clinical hours, including online supervision. The program prepares students for taking the national certification exam administered by the American Nurses Credentialing Center. In order to apply, students need at least a bachelor’s degree in nursing, a cumulative GPA of 3.0 or more, three professional letters of recommendation, a resume or a CV, registered nurse licensure and they also have to pass an interview. UCSF also has an excellent psychiatric/mental health nurse practitioner program. The school of nursing has 92 full-time faculty members and maximum graduate program enrollment of 507 students. A doctorate program is also available for the ones interested in obtaining higher education. The tuition fee is 26,803 dollars per year for in-state students and 39,048 dollars per year for out-of-state individuals. Financial assistance options are available. Apart from having to complete the coursework, students also need a residency. There are specialization possibilities in the fields of children and youth care, geriatric care and work with specific age groups. All of the UCSF students can apply for an American Nurses Credentialing Center certification. Both online and traditional classroom study formats are available. More information about the application requirements can be obtained through the UCSF school of nursing official website. The final entry in the list offers the same high educational levels as all of the other universities. University of Washington has a graduate psychiatric health nurse practitioner program and an opportunity to obtain a doctorate in the field. University of Washington is a public school that’s recognized for the reputable nursing department. There are 70 full-time faculty members and a graduate class size of 396 students. Tuition fees vary from 21,370 dollars per year for in-state students and 31,542 dollars per year for out-of-state applicants. Financial assistance options are available. Depending on the number of courses that they’re willing to take on during a single semester, students can finalize the program in approximately three years. After successful completion of the program, students can sit and apply for American Nurses Credentialing Center certification. The prerequisites for applying include a degree in nursing, minimum GPA of 3.0, unrestricted RN license and proof of English proficiency for international students.